It was easy to discount the Chromebook early on. The earliest models weren’t particularly capable, with limited functionality, an anemic app selection and a reliance on a constant internet connection. But the products were a surprise hit in schools, now comprising a staggering 58 percent market share in the classroom. It’s a success story by any measure, but it’s never been enough for Google. The company has long wanted the Chromebook to be more than just a study aid. It wants Chrome OS to be a true player in the laptop market, alongside Windows and macOS. It wants the industry to take it seriously. In 2013, the company released the first Pixel, a premium device designed to prove the category also could appeal to premium users. The first Pixel featured the highest resolution display in the space and became the first Chromebook to run more than $1,000. Google may have killed the Pixel name after two models, but the Pixelbook is nothing if not the logical successor to the line. The new device adds some new tricks, including a convertible display, pen functionality and Google Play access. It’s also the first laptop to sport Google Assistant built-in, courtesy of a devoted key. But for all intents and purposes, it addresses the same needs as the Pixels that came before it. The product has become more capable with each generation, through a combination of hardware and software updates. At some point along the line, it made that transition into full-fledged laptop territory, like Pinocchio finally transforming into a real boy. Google appears to see the new Pixelbook as the Chromebook’s mainstream moment as a consumer laptop. That’s probably a bridge too far — but unlike the earliest models, it’s one I certainly wouldn’t mind making a travel companion. The Pixelbook’s design is a pretty clear indication that Google’s vision of the future of PCs lines up pretty well with Microsoft’s Surface offerings. The standard clamshell has been traded in for a convertible, so the system can double as a tablet when the keyboard is swiveled 360-degrees. The line has had touch input since the beginning, but the addition of an optional pen points to a company increasingly interested in courting creatives — a category both companies seem convinced is on the verge of exploding well beyond the confines of macOS. Really, the Pixelbook is an attempt to be something for everyone. It’s a tall order, but a necessary one when you essentially only have a single laptop on the market. Google’s certainly done some great work from the design perspective. 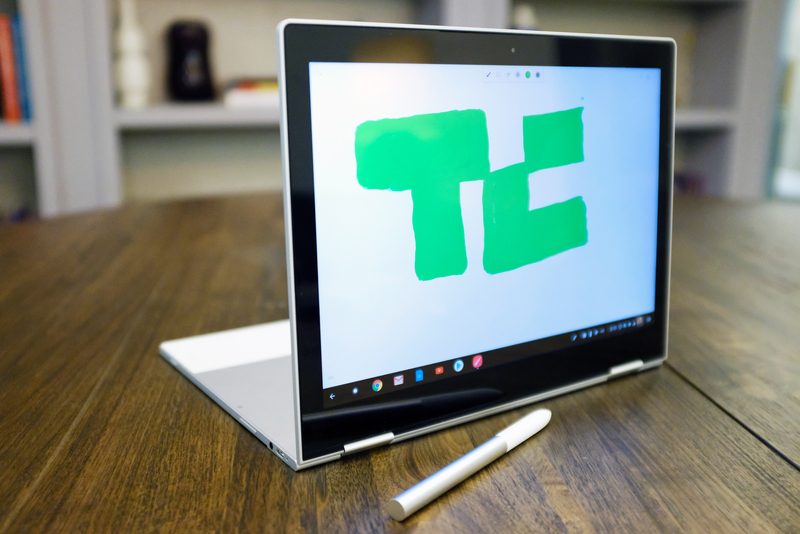 The Pixelbook is compact and solid, and marries an aluminum body with a glass panel up top that make the Chromebook both striking and differentiates itself from the millions of MacBook clones on the market. 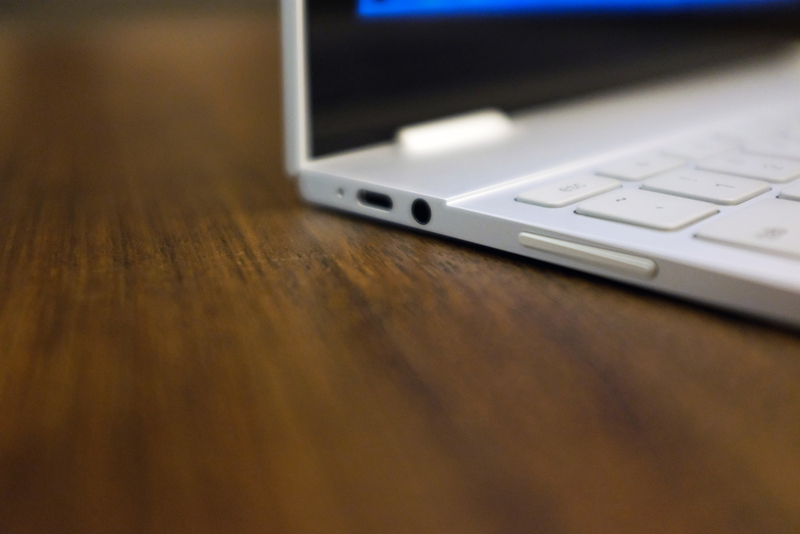 The second-gen Pixel laptop (2015) was one of the first laptops to ship with USB-C ports on-board — but back then, the company also included a couple of USB 3.1s for good measure. This time out, the company follows in the MacBook’s polarizing footsteps by just including a single USB-C port on either side. Like the Pixel 2 (the phone), the company no doubt dropped what it deemed excess ports for the sake of dimming things down — and because, well, things are just going in that direction anyway. For you, that means a dongle-filled future, as you attempt to plug in older accessories, or for those times when you need to use more than two peripherals at once. Of course, all the standard USB-C perks stand, including fast-charging, which should get you up to about two hours of battery life after being plugged in for 15 minutes. The screen’s a bit smaller than the 2015 Chromebook Pixel, at 12.3-inches to 12.85, likely in an attempt to make it a bit more compact — though you’ve got to have an eagle eye to pick up on that kind of difference. Ditto for the pixel density, which has been downgraded ever so slightly. It’s still plenty sharp, though, and unlike the Pixel 2 XL, it doesn’t suffer from that same sort of muddied color issue. The screen does, however, have a pretty massive black bezel around its edges. The hinge has a smooth swivel, though the bottom of the laptop doesn’t really have any weight to it, so you’re going to need to pull it apart with both hands, rather than letting gravity do the job. The Pixelbook also suffers the same issue as so many of these two-in-ones, with the top being a bit loose when the product is in laptop mode. That likely won’t be too much of an issue in day to day life, however, except in those instances when your plane hits a pocket of turbulence. All serve their distinct purposes, though, as Google will likely admit, some compromises have to be made to create any sort of convertible device. These are most clear when the device is in tablet mode. 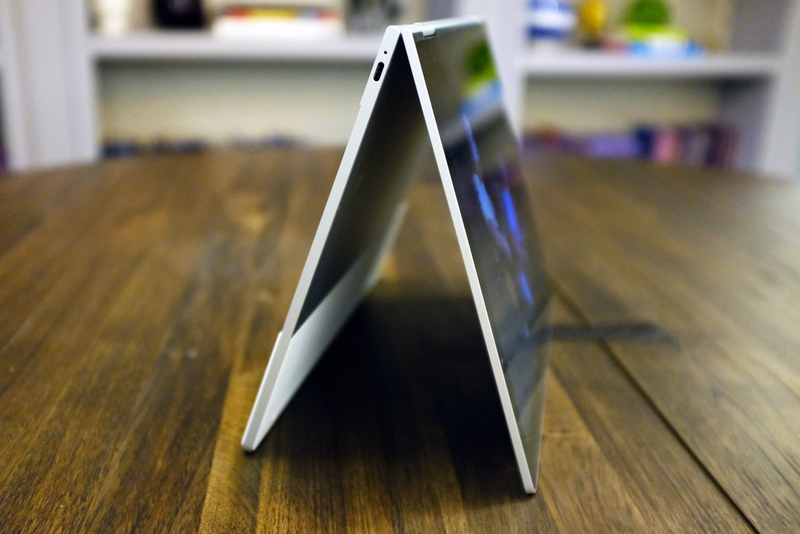 Google managed to make Pixelbook extremely thin, but it’s still quite thick for a tablet. And when swiveled into that position, the keyboard is on the back of the device. The keys are, of course, deactivated in this position, but it’s not particularly comfortable to hold between that and the thickness and weight of a 12-inch device. For that reason, any kind of extended tablet mode usage is probably best served with the device sitting on your lap. Otherwise, propping it up in tent mode is a pretty solid way to interact with the touchscreen. Both the trackpad and keyboard are full size. The keys are a bit squishy and may take some getting used to, depending on what you’re accustom to typing with, but they’ve got a lot more tactility than what Apple’s been putting on its devices of late. Of course, there are some quirks here. 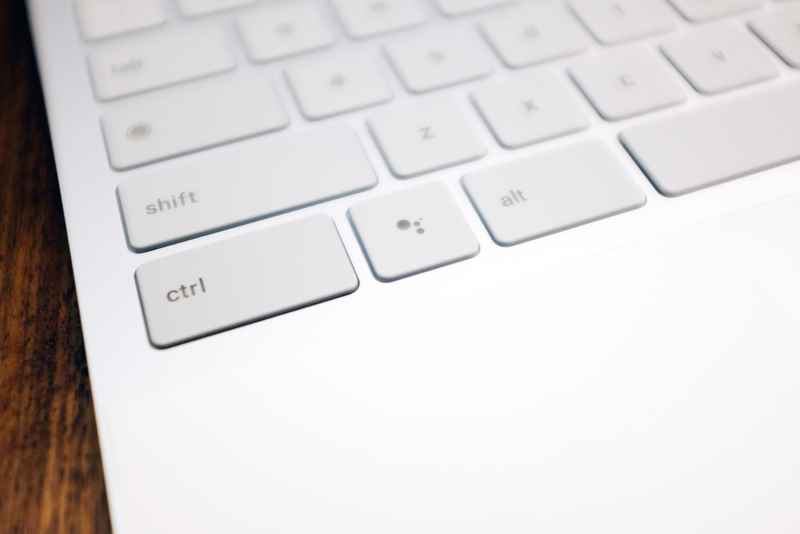 The Caps Lock key was banished from the QWERTY many moons ago, in a very Google-esque decision to include a devoted search button (the feature is still accessible by hitting Alt + Search). The big Control and Alt buttons, meanwhile, have been shrunk down, so a new button could be sandwiched between them. 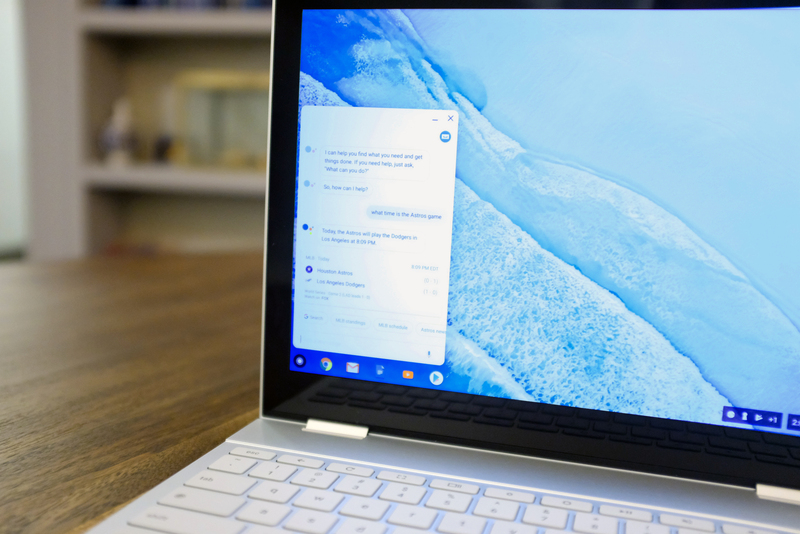 With the Pixelbook, Assistant arrives on a laptop for the first time, joining the ranks of Siri and Cortana. Like those offerings (and unlike Alexa), Assistant is becoming more than just a voice-only AI. Assistant can be accessed in three different ways: holding down the aforementioned devoted key, saying “OK Google” to the laptop or holding down the button on the Pixelbook Pen while circling a portion of text or an image. As with the mobile version, each input method has its place. When you’re dealing with a full-size keyboard, typing makes plenty of sense. Though I have to say, I didn’t find all that many instances in which Assistant was any easier shortcut than simply typing something into Google or simply clicking into an app on my own. The voice functionality actually makes sense when the Pixelbook flips into a mode other than laptop, using four on-board mics to fire up Assistant with the familiar keyword. Certainly this saves time over attempting to touch type a question into the massive laptop. The Pen option is the most compelling of the three, if only because it’s different than the standard implementation. Circle a bit of text or a picture from anywhere on the laptop and it will pull it directly into the Assistant dialogue box. From there, it will attempt to offer some context. I circled a picture of the Eiffel Tower and it recommended hotels near the Parisian landmark. For most searches, the input method is a bit of a blunt instrument, lacking the specificity of a text or voice-based search. The addition of Assistant is interesting and clearly part of a larger ecosystem play for Google, but I’m not really convinced that it’s anything approaching a necessary addition to the desktop Chromebook experience. It’s all part of a continued evolution for Chrome OS that has found it slowly but steadily evolving from what was essentially an overblown browser into a legitimately useful desktop operating system. That evolution was helped in no small part by the addition of the Google Play Store late last year, which brings all Android apps to the OS. Granted, they’re not all optimized for the screen size, but it opens up functionality immensely. The same can be said for the Pixelbook Pen. Once again, the implementation is solid. The company enlisted the help of Wacom, the go-to company for creating these sorts of input devices, and the result is a responsive stylus with good pressure sensitivity and surprisingly little latency. The Pen actually does a bit of predictive drawing to keep up with the pen movement. It’s possible to trick it by making abrupt movements, but you’re not likely to notice it when writing. 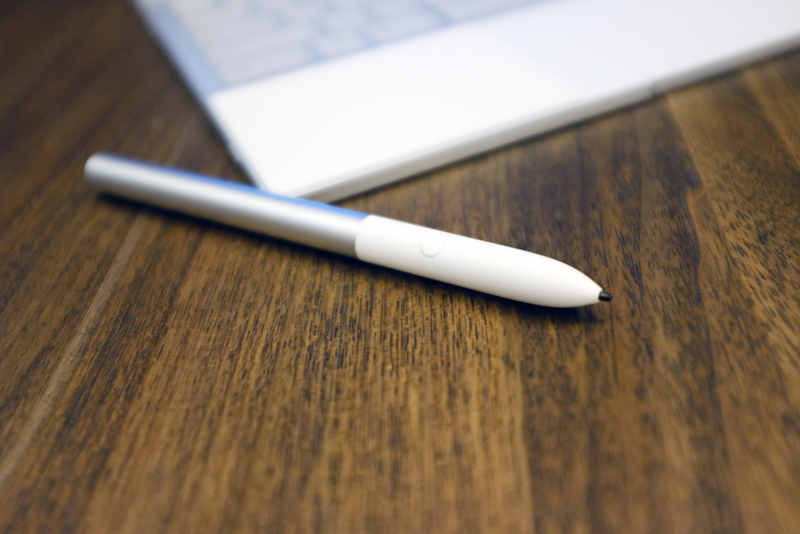 As with Apple’s Pencil and the Surface Pen, it’s hard to imagine the peripheral as anything but a niche device for the time being. Google is convinced that the creative space will only grow, but there’s a reason the company opted not to include it with the $999+ price tag. Ditto for the fact that there’s no slot for it on the Pixelbook, or even a magnetic attachment (though third-parties are already releasing loop accessories). At $99, it’s priced the same as Apple and Microsoft’s offerings, which is probably a bit high for the casual consumer who simple plans to fill in the occasional adult coloring book or doodle on an art app from time to time. The intention of the Pixelbook is to show what Chrome OS is really capable of, and by that measure, the laptop passes with flying colors. If you haven’t played around with one of these devices in a few years or are only accustomed to the low-end versions rolled out in classrooms, you’ll be pleasantly surprised by how far things have come. The operating system is fast, secure and capable enough for day to day use. That, coupled with a solid, adaptable hardware design and a few extra tricks like Pixel phone automatic tethering when the connection drops out (not currently available at press time), makes the Pixelbook far and away the most capable device the category has seen so far. Even so, it’s not likely to be the mainstream laptop Google’s been dreaming of. It certainly makes sense for school kids weaned on the operating system who are looking for something a bit more powerful. But Chrome is still a bit of a hard sell for many consumers already locked into Windows or macOS — and certainly the $999 starting price tag isn’t going to win over people looking to pick it up on the cheap.